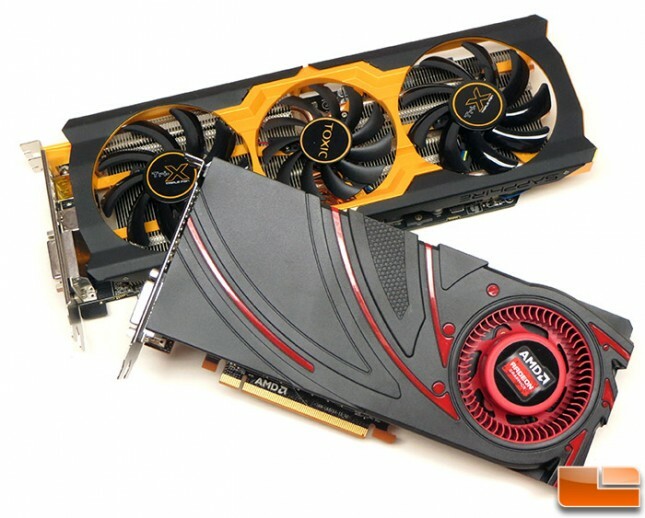 AMD Radeon R9 270X & Sapphire TOXIC R9 270X Video Card Reviews - Legit ReviewsWhat is the best video card for $199? What is the best video card for $199? When it comes to discrete graphics, the $199 price point is known as the gamer’s sweet spot by both AMD and NVIDIA. This is arguably the front line in the battle for your money when it coming to gaming graphics cards. The AMD Radeon R9 270X is AMD’s offering to gamers at this competitive price point. The Pitcairn GPU is used on both the AMD Radeon HD 7870 GHz Edition and the Radeon R9 270X, so this is more or less just a re-brand of the AMD Radeon HD 7870 GHz Edition with higher clock frequencies and an improved cooler. The AMD Radeon HD 7870 GHz Edition video card was originally released in March 2012, so most gamers should be familiar with card. Since the new AMD Radeon R9 270X uses the same exact 28nm Pitcarin GPU as the Radeon HD 7870 GHz Edition there are no major architecture changes to talk about. The Pitcarin GPU features features 1,280 stream processors, 32 ROPs and either 2GB or 4GB of GDDR5 memory on a 256-bit memory bus. AMD did increase the clock frequency on both the core and memory, so that is the key change between thee two cards. The AMD Radeon HD 7870 GHz Edition was clocked at 1000 MHz on the core and 1200 MHz on the memory. The new AMD Radeon R9 270X runs at 1050 MHz on the core and 1400 MHz on the GDDR5 memory. These new clock speeds help the card have 2.69 TFLOPS of compute performance versus 2.56 TFLOPS before. The typical board power went up from 175W to 180W due to the higher clock speeds. Here is a quick table that compared the key specifications for both cards. Now that you know what the key changes are between the ‘old’ AMD Radeon HD 7870 GHz edition and the ‘new’ AMD Radeon R9 270X, we can dive into the review! 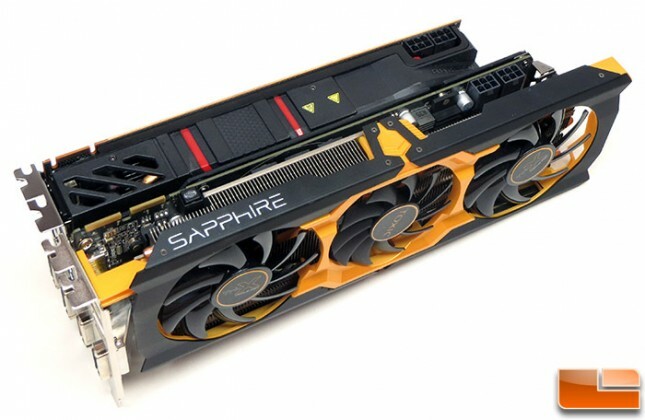 The Sapphire Toxic R9 270X 2GB runs $239, which is $40 more than base model, but features an extreme factory overclock, the new Sapphire Tri-X GPU cooler (3 Fans and 3 10mm Heatpipes), 10-phase power and higher quality components for reliability (double sided chokes and solid capacitors). As you can see the Sapphire Toxic R9 270X 2GB video card has the core and memory clock speeds overclocked 100MHz over the reference card, so this card will certainly be faster in game titles! This is also the lowest priced ‘Toxic’ card every released by Sapphire! Both AMD Raedeon R9 270X video cards feature dual-slot coolers and share the same GPU and amount of memory and that is where the similarities end. Sapphire created an entirely custom PCB, fitted it with higher quality components (IE: Black Diamond Chokes and Solid Capacitors rated at 5000 Hours) and then topped that all off with an insanely huge triple fan GPU cooler! 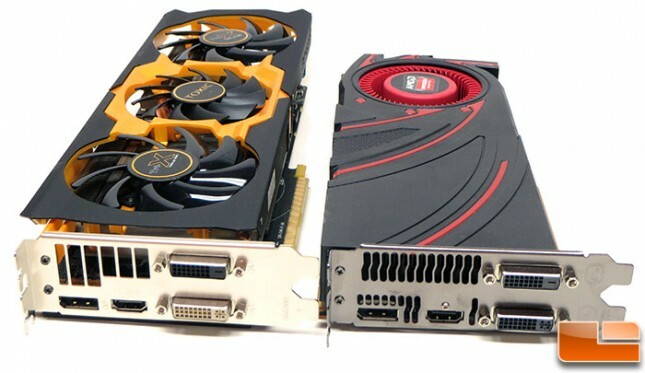 The AMD Radeon R9 270X reference card measures 9.5-inches in length and the Sapphire Toxic R9 270X is a full 12-inches long (PCB Measures 10.25-inches, but the fan shroud extends past the PCB). The Sapphire Toxic R9 270X is by no means a small card and it won’t fit in all PC cases, so be sure to check your measurements if you are thinking about ordering one of these beasts in. When it comes to video outputs you have a pair of DVI connectors (DVI-I and DVI-D), Display Port and HDMI. Both cards have high-airflow exhaust brackets to reduce noise and improve airflow for better cooling. Both cards feature a GPU cooler with copper heatpipes, but the Sapphire Toxic R9 270X uses three massive 10mm thick heatpipes that go to one aluminum cooling fin array and two smaller 7mm heatpipes that connect back to the main cooling fin array that sits directly above the GPU. This GPU cooler better perform good as it has two cooling fin arrays and a total of five heatpipes. How much do these cards weigh? 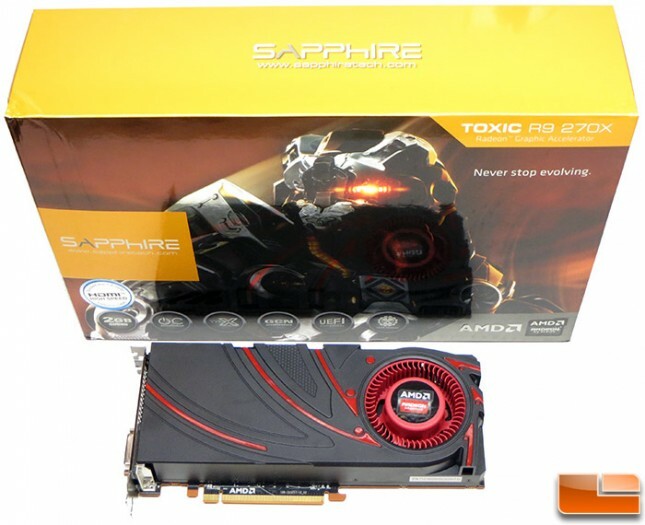 The AMD Radeon R9 270X weighs 1.85 pounds and the Sapphire Toxic R9 270X weighs 2.25 pounds! 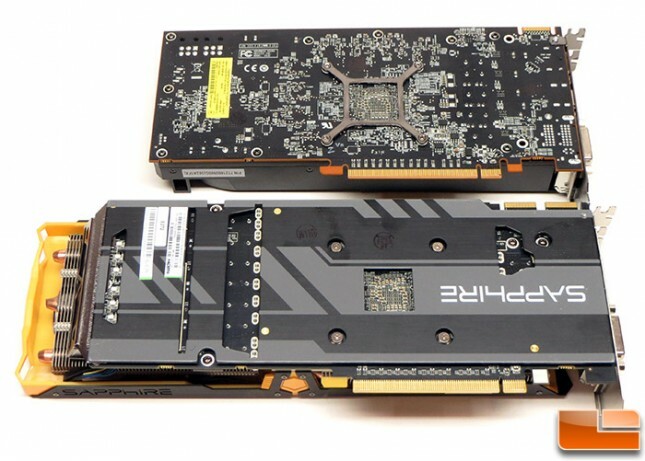 Both cards have a pair of 6-pin PCI Express power connectors located along the top edge of the video card for a combined total of 150 Watts of additional power. Sapphire recommends a 550W or greater power supply with two 75W 6-pin power connectors for this video card to operate properly. If you wanted to run AMD CrossFire at some point in time, the recommended PSU is a 600W or greater model. 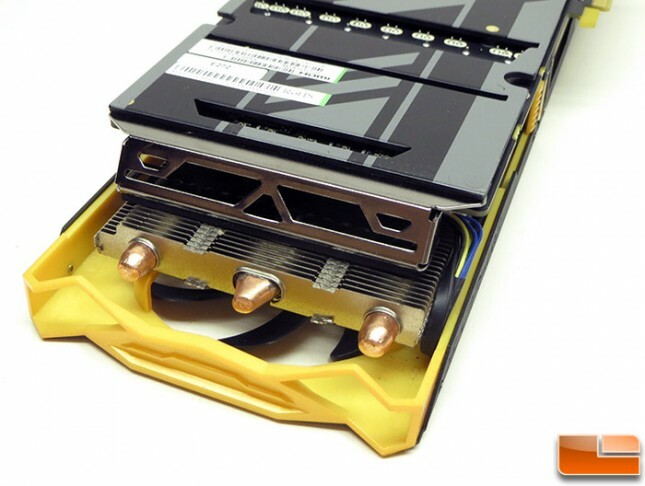 Notice that the AMD Radeon R9 270X has a single CrossFire interconnect on top for pairing it with another graphics card and the Sapphire Toxic R9 270X has two. We aren’t sure why this card has two interconnects and have asked both Sapphire and AMD for clarification. It should be noted that the word Sapphire along the top edge of the Toxic R9 270 does light up when the card is turned on and the is a burnt orange color. The back of the AMD Radeon R9 270X reference card doesn’t have a backplate, but the Sapphire Toxic R9 270X does! We really like backplates on video cards as it makes them look more finished in the case and reduces the chance of hurting the card when installing and removing it from the chassis. It should be notice that with this backplate on the card it is technically a 2.2-slot card, so if you have a chipset right behind your primary PCIe x16 slot you might have some clearance issues. 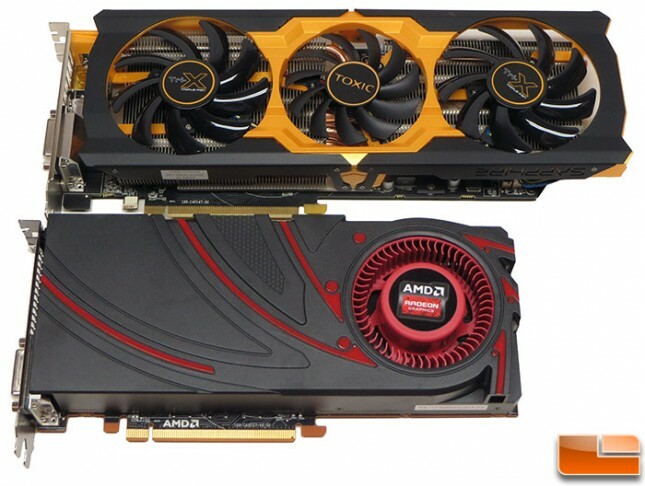 The AMD Radeon R9 270X and Sapphire Toxic R9 270X are two good looking cards, but how do they perform? Let’s put them both to the test and see how they do!